Viessmann Vitodens system boilers up to 35 kW installed together with a Vitocell 200 or 300 unvented cylinder are the perfect combination to meet G3 building regulations without the need for an energy cut-off valve and cylinder overheat thermostat; these are integrated into the boiler. 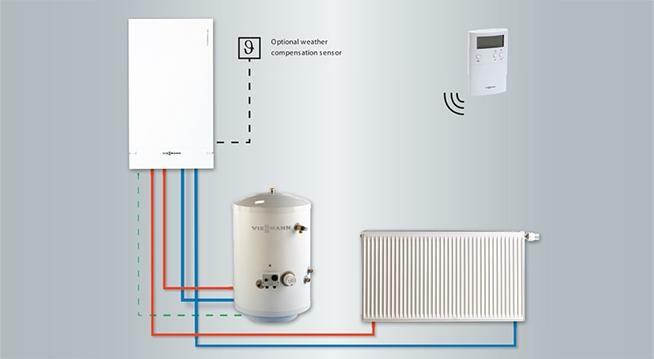 * Cylinder overheat thermostat is supplied as standard for when the cylinder is used without a Viessmann boiler, but in this installation is obsolete. As a manufacturer of the full range of renewable energy technologies all Viessmann boilers are 100% compatible with solar thermal panels. The Vitodens 100-W range has the added advantage of boiler suppression, when using Viessmann solar panels and a dual coil cylinder. This means that the hot water system will always take advantage of solar power, whenever solar energy is available and the boiler will only fire to ‘top up‘ the DHW heating process when absolutely necessary – resulting in significant fuel savings.